In 2015 Dutch startups have raised at least 429 million euro – more than 70 million euro less compared to last year. The good news: the number of deals doubled from 76 to 153. At StartupJuncture we try to report all funding news about Dutch startups, in order to provide insights into the Dutch funding situation: who is actively investing, what type of companies are fundable in The Netherlands and also how much startups can raise here. Because our goal is to provide insight for startups in all phases, we apply a broad definition of ‘startup’: we report on early startup deals from business angels up until large investments in grown-up scale-ups. The result is one of the most complete lists of startup deals closed in The Netherlands in 2015. Like last year we are making the full list available for anyone. Readers can look at the top 5 (visualized below with help from Dutch startup LocalFocus), or use the full list for their own analysis if they would like to apply their own definitions. 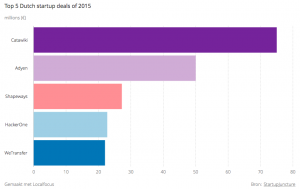 In the list of 2014 we counted 76 deals adding up to 500 million (skewed by a whopping 200 million for Adyen). This year the list is much richer with 150 deals. The total is slightly lower, adding up to 428.7 million. The average deal size of 2015 was 2.82 million euro, compared to 6.58 million euro in 2014. The median investment this year was 650.000 euro, last year this was 450.000 euro. The top 5 deals went to 5 completely different companies: Catawiki (collecting), Adyen (fintech), Shapeways (3D printing), HackerOne (IT security) and WeTransfer (data storage). Of these companies, HackerOne is the youngest company: founded only in 2012, the company has grown quickly into the leading platform for ethical hacking. The company has Dutch founders but the headquarter is located in California. The other companies could be called scale-ups: companies that are more than five years old and are growing rather than searching. Catawiki is founded in 2008, Adyen in 2006, Shapeways in 2007 and WeTransfer in 2009. For early stage investors, the remaining 145 startups are of more interest than the top 5. It is good to see that so many different startups have found funding. The list contains startups from all sectors: medtech, software, data, retail, travel, edtech etc. Note that we only included deals of at least 50.000 euros. There are many investments below this threshold but we consider these informal deals. As you can see in the list, 2015 was the year of sustained succes for crowdfunding platforms and the convertible note or equity crowdfunding: we saw 15 deals made possible through platforms like Leapfunder, OnePlanetCrowd and Symbid. The deal sizes are getting larger, with the largest Dutch crowdfunding deal coming from the Bolt electric scooter – a solid success for the Leapfunder platform. To assess the health of the Dutch ecosystem, it is important to know where the money is coming from: did Dutch startups receive funding from Dutch investors, or did they have to travel abroad? We see both Dutch and international funding. In 61.3 percent of the deals, the money invested came solely or partly from a Dutch source. This is mainly due to the large amount of early stage deals (seed, series A) funded by Dutch investors. It’s safe to say that The Netherlands as an ecosystem has enough funding to allow people to grow your company. For later stage rounds however, our data clearly shows that the big money is coming from abroad: from the 10 later stage deals this year (series B and up), in only 3 cases Dutch VC’s were involved. Without much further ado: here are all the 2015 startup deals ranked in one table. The list is based on our previous quarterly overviews (click here for Q1, Q2, Q3 and Q4 2015), but updated. We have filled in the exact funding amount if this amount has been revealed. If not, we made an educated guess to insert the deal at the right position. If you believe a deal is missing, send us the details at team (@) startupjuncture.com. See some notes on criteria at the bottom. The goal of the list is to give an overview of investments into startups. We do not include pre-sales crowdfunding (like on Kickstarter), only convertible note or equity crowdfunding. We typically also do not count grants and subsidies, as they have different characteristics and would not be comparable. A startup should also have a Dutch connection: either the company must be based in The Netherlands (e.g. Mobypark) or have Dutch founders (HackerOne). For the definition of a startup: this is always arbitrary. As we said earlier: the complete table is helpful for anyone who defines the term ‘startup’ differently. For this list, we included big fish like Adyen and Catawiki because they’re still growing fast and, most importantly: these companies are a leading example for the rest of the Dutch startup scene. We tried to use all available public data sources. We relied on communication directly to the StartupJuncture team, information from accelerators like Rockstart and Startupbootcamp, information from incubators (e.g. YesDelft, ECE and UtrechtInc), information from crowdfunding platforms (Symbid, Leapfunder and OnePlanetCrowd) and from Dealroom, Angellist, Crunchbase and Index. For some of the deals we relied on other news media like FD, SiliconCanals and Emerce.